Posted: Sat Dec 29, 2018 12:23 pm Post subject: Governor on 8N Problem? revved up to max immediately upon starting. So, is this a governor problem I have here? And if so, am I looking at a rebuild, a replace, or what? Appreciate any help! Posted: Sat Dec 29, 2018 1:37 pm Post subject: Re: Governor on 8N Problem? The throttle butterfly (in the throat of the carburetor) is held to the throttle shaft by two little screws, it wouldn't be the first time they've fallen out. If that's not the problem, the way a "N" governor works is that the external spring tries to pull the throttle wide open, and centrifugal force acting on the weights (balls) inside the governor tries to pull the throttle closed, and the speed at which the forces balance is the speed the engine will run at a given throttle setting. The force from the weights passes through a ball thrust bearing onward to the "fork" on the governor output shaft, making the lever on the outside of the governor move to close the throttle butterfly. If the bearing fails and comes apart, that makes for a lot of "lost motion" so the governor can't fully close the throttle butterfly to control speed. So that's what I'd check for... first, check if the throttle butterfly has come loose, then remove the governor and check the mechanism between the weights (balls) and the governor output arm. Posted: Sat Dec 29, 2018 2:12 pm Post subject: Re: Governor on 8N Problem? Posted: Sat Dec 29, 2018 2:21 pm Post subject: Re: Governor on 8N Problem? 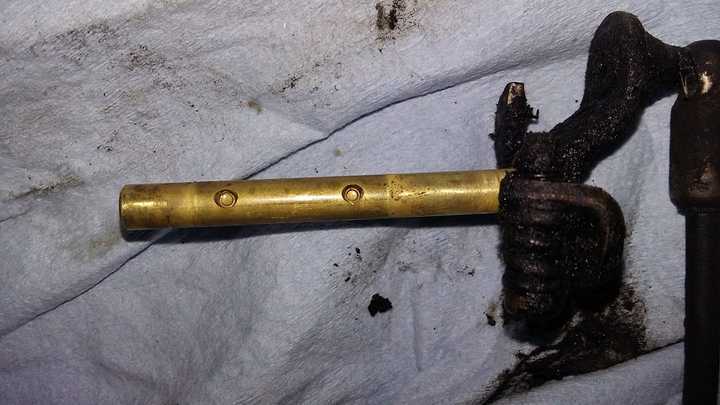 "probably a spring or 2 broke in the gov"
Trouble is with that statement, there's NO springs "IN" an "N" governor, and if the EXTERNAL spring breaks, the engine will go to idle, rather than "over rev". Posted: Sat Dec 29, 2018 2:28 pm Post subject: Re: Governor on 8N Problem? Posted: Sat Dec 29, 2018 3:39 pm Post subject: Re: Governor on 8N Problem? OK...I?ll have to wait til morning to try these suggestions....was busy on something else all day. I have a diagram of the 8N governor so I can see what we?re talking about here. I REALLY hope it?s just the butterfly in the carb coming loose. Thanks, guys. Posted: Mon Dec 31, 2018 9:17 am Post subject: Re: Governor on 8N Problem? 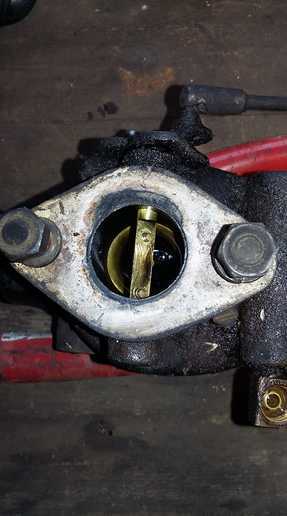 So I haven’t been able to check the carb yet....but if it IS the butterfly valve having come loose, and the screws are out and missing, where do I get the screws to re-attach it? I don’t see that they come with either the carb rebuild kit or a new butterfly valve on this site. Maybe they do and they’re just not shown, but I’m assuming they’re a specialty screw and not to be found at just any hardware store? Posted: Mon Dec 31, 2018 9:47 am Post subject: Re: Governor on 8N Problem? They are just small, short brass screws, probably #4-32 or #6-32. Usually, they were "staked" in place at the factory by mashing the threaded end a bit. Once someone removes them to "kit" the carb, they may NOT get staked again. I typically us a tiny drop of Locktite. Posted: Mon Dec 31, 2018 11:28 am Post subject: Re: Governor on 8N Problem? Posted: Mon Dec 31, 2018 2:36 pm Post subject: Re: Governor on 8N Problem? Posted: Mon Dec 31, 2018 2:39 pm Post subject: Re: Governor on 8N Problem? Posted: Mon Dec 31, 2018 3:29 pm Post subject: Re: Governor on 8N Problem? WOW, I made a good guess, eh? Looks like you should be able to grab the remains of the screws with a small Vise Grip and unscrew them. A "basic" carb kit likely won't have a "throttle shaft" in it but a "complete" or "master" kit probably will, as the ones sold by this very site do. Wonder where the butterfly went... it's brass and the "side valve" engine has lots of clearance between the piston and head. One bad scenario would be if it wedged under a valve so it couldn't close/seal. Carb kit page on this site. Posted: Tue Jan 01, 2019 8:28 am Post subject: Re: Governor on 8N Problem? So in looking on here, I don’t see where they sell JUST the butterfly disc for the 8N (I see they do for the NAA and up). The only one that has the disc is the $54 total rebuild kit, and I don’t want to do a total rebuild. I could by the throttle arm and the gaskets and the disc all separately for probably a third of that if they sell the disc by itself. Am I missing that somewhere? Posted: Tue Jan 01, 2019 8:50 am Post subject: Re: Governor on 8N Problem? Now, in looking a bit closer, it appears that the disc they describe as only going on NAA and newer actually has the same part number as the 8N (9N9585).....so maybe I’m ok just getting that and the other parts separately. With the cost of shipping on here, I hate to have to order some different part later because I made a mistake. Posted: Tue Jan 01, 2019 10:03 am Post subject: Re: Governor on 8N Problem?